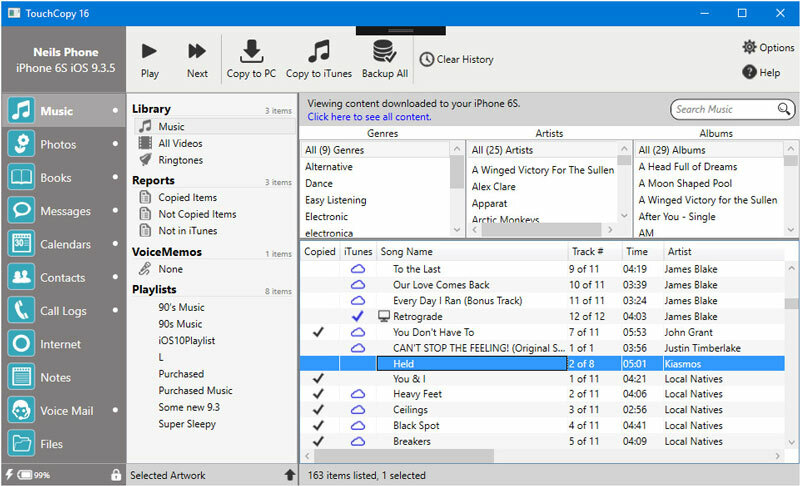 TouchCopy is a very useful utility that runs on PC or Mac which allows users to transfer content from their iPod or iOS device to their computer or iTunes. Music, Videos, iBooks, Playlists, podcasts, album art, ratings and play counts can be copied from all iPod, iPhone or iPad devices. There is also a backup option, enabling users to save all their iPod music, movies and playlists at the touch of a button.Music and video can even be played through a computer without the need to have iTunes installed.Standard features aside, TouchCopy also has some neat unique features, like the ability to use the iPod Touch or iPhone as an external disk drive and copying of iPhone SMS, MMS, Voice Mails and Voice Memos.The software also enables iPod and iPhone photos and videos to be viewed and copied to a computer.TouchCopy allows users to save their SMS, WhatsApp and iMessages to their computer as HTML or PDF, and even allows a user to print them directly through the app.Those who like to combine work with leisure will find the business tool useful, allowing iPod and iPhone notes, contacts and calendars to be managed and copied between the two devices.TouchCopy works with all iPods, iPads and iPhones, including the new iPhone 7 and is compatible with Windows Vista, Windows 7, Windows 8 and Windows 10.TouchCopy is available as a free trial download, allowing up to 100 iPod songs or videos to be copied.The full version of the software costs $39.95, giving access to all functionality, free customer support and a lifetime of free software updates. DRMBuster is an all-in-one media application to convert any type of purchased or copied video (WMV, M4V, FLV, MKV, AVI, TiVo) and audio files (WMA, M4P, M4B, AAC, RAX, AA, FLAC), both protected and non-protected, to commonly used formats. You are able to transfer your iPod files like music, movies, photos, etc. to the Mac with the wonderful 4Videosoft iPod to Mac Transfer. It is very easy to handle so that you can finish your transfer within a few seconds.